I wrote a simple reply to my friend: Makes me so sad. By all accounts Debra Harrell was making the best of a difficult set of non-choices. In an economy where unemployment is rampant and where the unemployment rate for black women (over the age of 20) is double the unemployment rate for white women, here is a mother who was gainfully employed without childcare in the summer. Working at McDonald’s and getting by with a child is hard enough. In Aiken County, South Carolina where the story transpired, a food service worker earns on average about $8.50 per hour. This would be sufficient for one adult, but it is not a living wage for one adult AND one child. Besides the harsh financial reality of family life, parents raising children face a daily gauntlet of decisions, and every one of these choices carries with it some risk. What should we feed our children, what should they wear, how should they spend their time, with whom should they spend their time, and most importantly, am I screwing this up? Many of these decisions are easy if you have money and a partner and extra time in your life. Without those things, the scope of your choices is limited. Often, you have no choices at all. Ms. Harrell has had to grapple with some decisions that, so far as a parent, I have not encountered. I have a partner and we have a stable childcare arrangement. My children are also very young, and surveillance of little ones is more clear-cut than older children. Based on the way the story has been told in the media, I believe that she made the right choice for her family because she trusted her child. Much of the court of public opinion is working through the rhetorical conversation about when children should be allowed to stay home alone, go out alone, or be in charge of themselves (here and here). Not every nine-year-old could handle being on their own for several hours a day, but according to countless retrospective accounts of “free-range” childhoods, many present-day adults roamed their neighborhoods without supervision as children, returned home when the street lights came on (or when their parents rang a cowbell), and lived to tell the tale. Many will counter this nostalgia, saying that we live in a different and possibly more dangerous age. More likely, twenty-first century parents are hyper-vigilant of their own children and the children in their village. I have had my fair share of parenting fails—some public and some private. Most parents (especially mothers) proclaim their silliest or most embarrassing mistakes, crowning themselves “mother of the year” in jest. In my parenting village, there are probably some parents who find my choices radical and others who find them conservative. If a mom or dad friend casts aspersions on what I do with my children, I typically listen and move on, internalizing what might help and shedding what stings. The bystander in Ms. Harrell’s story seems to have skipped this step—the parent-to-parent moment. Instead, Ms. Harrell’s story opens a whole vortex of parenting worry I had never even considered—the meddling stranger. Never have I witnessed or worried about another parent or child to the degree that I would have to bring in law enforcement. And even if I had, I would probably bring it to the other parent first before making a fateful call to local police. 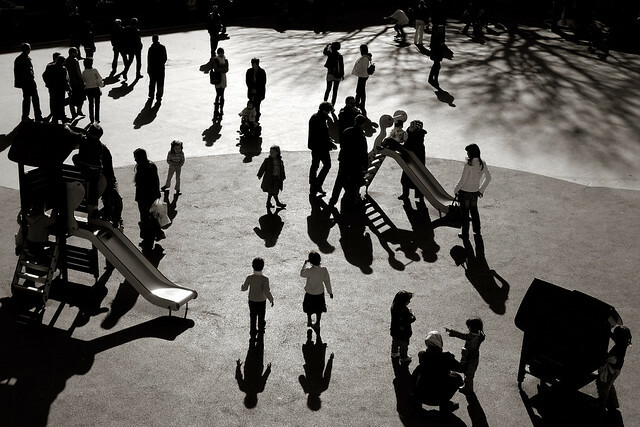 I’ve been in public parks where there were too many children to follow, where big kids were running around like maniacs, and when I may have wondered, where are the parents? But I never cornered those kids and asked them point-blank. It makes me wonder what am I doing that others might evaluate even in passing that might warrant that fateful call? Do I dare even share those details here for fear that someone would find our home address and follow up? If we use this story as our barometer, we would have to inform on many other parents (both real and fictitious). Since summer has started, my children (ages 3 and 5) run in and out of our house to the back yard and the front yard and not always under our watchful eyes. Any neighbor could catch them riding their bikes or more likely arguing in the front driveway without my husband or me close at hand. As irrational as it might seem, I worry slightly about the call of some meddling stranger who disapproves of our choices. For all of the times when I wonder where is my village, now I am left wondering, should other folks stay out it? Whether we agree that age nine is an appropriate time for children to be on their own, age nine is certainly more than old enough to remember everything that happens in your life. Nine is old enough to understand when your life is in the middle of serious upheaval, and it is old enough to feel scarred by a system meant to protect you. Maybe we should think about what we want for our own children and use this child’s pain as the barometer. I doubt we would wish estrangement and foster care on seemingly functional families. I felt relieved when I learned this week that Ms. Harrell has been reunited with her daughter and has had support from countless strangers who saw the need to offer support without judgment. Being a good citizen of the village means knowing when to intervene, when to pass judgment from afar and when to simply look on from a distance. Going forward, all I hope is that we find ways to make our villages better by trusting each other, looking out for our families and kids, and offering up a helping hand instead of the arm of the law. This entry was posted in community, everyday life, family, kids, lessons learned, motherhood, parenthood, personal, vacation, women, work, writing and tagged Debra Harrell, McDonalds, parenting. Bookmark the permalink. This was the post I wanted to write about this incident. Well said. Thanks for reading, commenting, and sharing with your readers! I wanted to write something about this preposterous incident but I couldn’t quite get it right. Rogue Cheerios to the rescue! Fantastic all over. Came over from Nostrikethat. Thank you for your candor and bravery. I’d not heard of this. Now for my two cents. My nine-year-old would totally know how to handle herself at a public park alone, with water and a lunch kit for the whole day if need be (I came up this way as well, in the 70’s). That is, right up until there were no other people around and she found herself utterly alone — the only “red flag” that can’t easily be rectified for her complete safety in this wacky world. As a mother, I am hard-wired to help all kids in need, even when I think their parents may have missed the mark; there are plenty of others like me too, especially at parks, malls, kid hangouts. In that situation, I would not have called the cops but would have been a watchful eye (had I known) and waited until another watchful eye arrived to take over village duty. Such an easy thing to do. But I still wouldn’t leave my child alone if I didn’t HAVE too. I’m wired that way too.